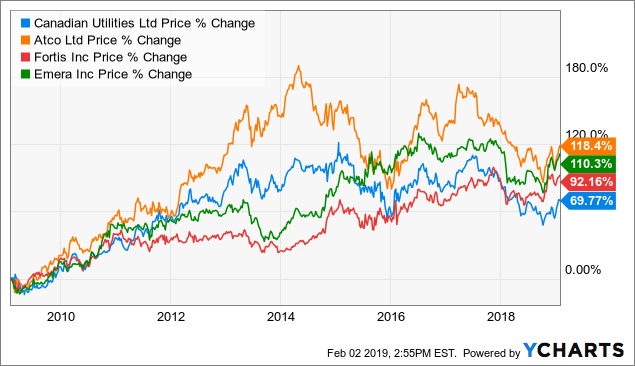 ATCO (TSX:ACO.X) and its subsidiary, Canadian Utilities (TSX:CU), take the 4th and 1st place as Canadian stocks on the TSX, which have increased their dividends year after year. And they just increased their dividends, but they have meaningful exposure to Alberta, which is challenged by low commodity prices and has slowed down the growth of the utilities in recent years. As a result, ATCO and Canadian Utilities’ payout ratios have nudged higher over time. their dividend increases are slowing down. From 2012-2018, ATCO and Canadian Utilities increased their dividends by about 15% and 10%, respectively. Their Q1 dividend hikes were 7.5%. Surely, if there’s a boom in the Albertan economy, it’ll be reflected in ATCO, as shown below when the WTI oil price was over US$100 per barrel in 2014. But let’s not count on that happening anytime soon. Above is the 10-year chart, comparing the TSX price performance of selected regulated utilities. If you do decide to invest in ATCO or Canadian Utilities, choose one or the other but not both, because ATCO is the parent of Canadian Utilities. Recently, I wrote about Enbridge (TSX:ENB)(NYSE:ENB) in 3 Ways To Play The Energy Sector. It was a good time to accumulate Enbridge stock when it was in the CAD$38-44 range, but back then, there was more negativity surrounding the stock. Enbridge took time to digest the Spectra Energy merger, which added key natural gas transmission, storage, distribution, gathering, and processing assets to the company. Last year, Enbridge sold CAD$7.8 billion of non-core assets to help reduce its debt levels. Currently, Enbridge is a reasonably valued. It offers a relatively safe dividend in the energy space that may appeal to income investors. At about CAD$48 per share, it offers a 6.1% yield. Enbridge has some resistance at about CAD$48 and some support at about CAD$46. The chart looks more positive after it made higher lows and a higher high. Looking for more attractive dividend stocks? Here are 5 top Canadian dividend ideas fresh from the oven you wouldn’t want to miss. Disclosure: At the time of writing, the author owns TSX:ENB.